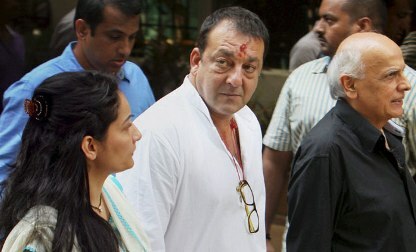 Bollywood actor Sanjay Dutt is currently lodged at Yerwada jail, serving his 42 months of sentence in the 1993 Bombay blasts case. The famous actor has applied for a parole in order to receive treatment for an ailment which has not been disclosed by the authorities of Yerwada jail. The application from the ‘Munna Bhai’ actor was confirmed by the jail personnel on August 20, 2013. He went on to say that the divisional commissioner will receive a detailed report from the concerned police stations and then decide on the application. While the parole application is being considered, the authorities will also take into consideration the conduct of the 53-year-old actor. The TADA court convicted the Bollywood actor for illegal possession of a 9 mm pistol and an AK-56 rifle. A series of bomb blasts in March 1993 killed about 257 people and injured more than 700 people. Sanjay already served a year-and-a-half in prison and after the decision of the Apex court, the actor has been sent behind bars for the remaining 42 months.